As we enter into the second week of Advent, we recall the time Mary and Joseph spent preparing for the birth of Jesus – time spent in joyful anticipation. Now, we wait in hopeful anticipation for Christ and strive to shape a world where all children are welcomed and cared for, including immigrant children and families. As we prepare for the coming of Jesus, we are reminded of children across the country whose lives are affected by federal policies. 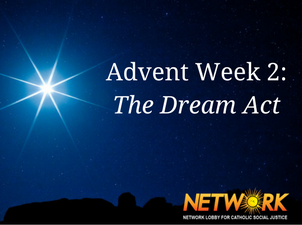 This week, we explore the current reality for DACA-recipients who are facing enormous uncertainty during this Advent season. Deferred Action for Childhood Arrivals (DACA), which protects young immigrants brought to the United States as children, runs out in less than three months. Now, more than ever, the security of Dreamers is at risk and we need a legislative solution from Congress. Dreamers are raising their voices to express their concerns and to vocalize the pain and suffering they have experienced. Heyra Avila, a Dreamer who lives in northern Kentucky, shares her experience as a Dreamer in our latest blog post, Dreamer’s Survival Fight. “We all essentially live life day to day, not knowing what tomorrow will bring. We wake up, exist, and survive. Those are all blessings that get taken for granted too often and too easily. Surviving looks different for each individual. For me, surviving means fighting. My parents and I fought for survival and to break through poverty when we decided to cross the border without the proper documentation. We risked everything we had in search of a better life. Congress still hasn’t passed the Dream Act. It is time to engage in conversation! Check out Emerson Collective’s discussion guide on how to talk about the Dream Act with your family and friends this holiday here. We pray in great hope during this darkest time of the year that you shine your light on those living in the shadow of darkness, especially those who are undocumented with no path to permanent resident status or citizenship. To those who say, “Throw them out. Keep them out.” we pray that you drive out their fear and change their hearts to be welcoming and inclusive. Enlighten our minds and hearts to welcome you in the “stranger” who is seeking posada (shelter) and knocking at our door. We pray that members of Congress have the courage to pass a clean Dream Act to allow our immigrant brothers and sisters to reach their full potential. Open the doors of our hearts and minds to bring about compassionate immigration laws that will allow for the fullness of life and belonging. May we bless all families and help us realize that every family is holy. This entry was posted in Front Page, Immigration, International Peacemaking, Mend the Gap, Spirit Filled Network, Women and Families on December 11, 2017 by maryc.